Use your own wedding logo or image to design your own wedding dress label. 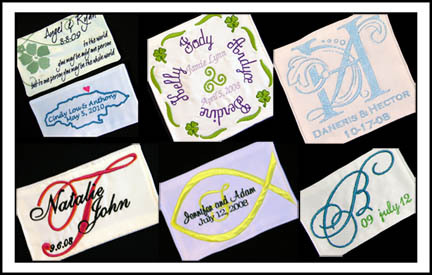 We take your monogram/design that you are using for your wedding, and digitize it into an embroidery design to be used on your label. These are some of my favorite labels! While we love to take on a challenging label, please keep in mind that not all monograms will work, and additional time is required for the digitizing of your logo/design. If you have any questions, feel free to email us the logo first, and we can tell you if it's possible to digitize or not. Digitizing a logo can take some time, and is not always possible, & some monograms with excessive detail may cause the pricing to vary, but we can let you know that when you send us the monogram to look over.